Fuzzy Cognitive Mapping (FCM) is a research method suitable for getting an insight into stakeholders' perceptions towards some issue or problem. The objective is elicitation of qualitative data which are then used to build a model of the system in terms of a set of variables and the causal relations among these variables, which are recorded as directed links in a graph. Variables can be can be “physical quantities that can be measured, such as amount of precipitation or percent vegetation cover, or complex aggregate and abstract ideas, such as political forces or aesthetics” (Ozesmi and Ozesmi, 2004) but are not assigned any number. The links are assigned a number; Kosko (1986) was the first to use fuzzy causal functions (numbers probabilistically drawn from the range [-1,1]) to calculate weights and therefore integrate uncertainty into the models. 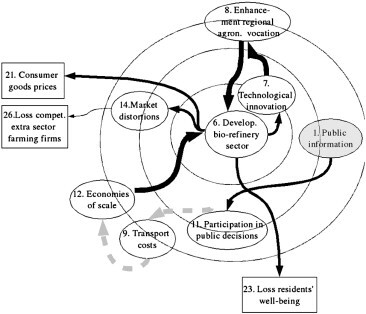 Visualisation and analysis of the resulting FCM can be useful in several ways: to identify possible ‘drivers’ of development of the whole system (and therefore policy levers); to elicit behavioural rules of actors, their probable responses to different policies, and how these may in turn affect a system; or to compare and contrast different the perceptions of different stakeholder groups and raise awareness and develop shared understandings of this, for example. Many authors highlight the speed and ease with which sufficient information can be gathered to build a FCM. A drawback of the method is that the maps are static and found to not easily incorporate new information. On the other hand the functions/weights can be easily changed. Optionally, a neural network computational method can be applied to compute an outcome for given initial conditions (which may include policy scenarios). We could find no example applications in climate adaptation research or practice. Ozesmi and Ozesmi (2004) review a handful of examples in ecology. Ozesmi and Ozesmi (2004) develop a multi-step approach to combine opinions of different experts and knowledge of local people into several individual and combined FCMs, and Prosperi et al. (2010) use FCM as a way of obtaining knowledge of local people about the possible factors affecting the development of biorefinery facilities in rural areas in Foggia, Italy. Despite the lack of examples, the method seems to have some potential in adaptation decision support. The number of concepts that can be represented in such a map is often in the range 10-30 nodes, and it can therefore be used to represent quite complicated problems with complex relationships that include feedbacks, as often do adaptation problems. It could be useful in the initial stages of better defining a problem. Similar methods have been used by those doing research on climate change policy making eg. policy network mapping (Turnpenny et al. 2005). Lack of take-up among decision makers in European adaptation policy could be related to its multilayered representation of the problem, the difficulty to interpret the structure and to generate recommendations, combined with the fact that policy researchers are not using it much in favour of other methods (eg. Turnpenny et al. use policy network mapping) to explore a system. Recommendations can be provided by comparing the outcomes of simulations of different policy options. On the other hand, with neural networks the transformation of all data into a 'black box' with numerical inputs and outputs has implications for transparency and understanding – in this sense it is quite similar to Bayesian Belief Networks. Kosko, B., 1986. Fuzzy cognitive maps. International Journal of Man-Machine Studies 1, 65–75. Turnpenny, J., A. Haxeltine, T. O'Riordan, and Lorenzoni. I. Mapping actors involved in climate change policy networks in the UK In Tyndall Centre Working Paper 66., 2005. Antonio Lopolito, Gianluca Nardone, Maurizio Prosperi, Roberta Sisto, Antonio Stasi, Modeling the bio-refinery industry in rural areas: A participatory approach for policy options comparison, Ecological Economics, Volume 72, 15 December 2011, Pages 18-27, ISSN 0921-8009, 10.1016/j.ecolecon.2011.09.010. It has become clear that the most common techniques used in appraisal (and decision support) have limitations in coping with the uncertainty associated with the climate change decision context (e.g. see Hunt and Watkiss, 2011). As a result, there is a growing consensus that economic appraisal of climate change adaptation should incorporate the multiple sources of uncertainty. While the focus on decision making under uncertainty has become widespread in the adaptation literature, with a focus on iterative adaptation management (Adger et al, 2006; Downing et al, 2012), there has been much less adoption of these concepts in the domain of economic assessment and appraisal. Indeed, the default position is to rely on conventional approaches, notably cost-benefit analysis, which has traditionally been adopted in appraisal of sectoral development plans and projects. Further, while it is recognised that new economic decision support tools may help account for uncertainty, there are relatively few practical adaptation applications to date. Against this background, IMPACT2C project has critically reviewed a number of approaches for potential use in adaptation appraisal, and search for examples of application. This includes fuzzy cognitive mapping.